❤ Kindly Remind: All the prompt goods are without logo in the top of product, please feel free to purchse! REY-X 17 OZ Built in Kitchen Sink Liquid Soap Dispenser, Stainless Steel Built in Hand Liquid Soap Lotion Dispenser Pump Thick Deck Installation Countertop for Kitchen Bathroom. 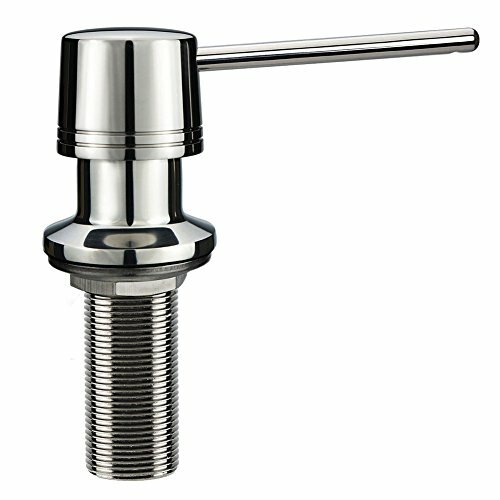 - This kitchen sink dish soap dispenser is made of heavy-duty 304 stainless steel - polished. - Large capacity 17 OZ HD-PE bottle can less fill up, strong, acid-resistance, corrosion-resistance durable. - Installation was easy. No tools needed! - Top refill, no need to unscrew the bottle from under the sink to fill it. - The reliable kitchen lotion soap dispenser pump make sure the pressure is appropriate, soap liquid jet smooth. The pump was better designed to handle the thick consistency of dish soap. ✔ The built in hand sink pump, steel ball, thread, spring are all 304 stainless steel, rubber gasket, high-quality with a 5-Year warranty keep you worry-free. ✔ Using the self-priming soap machine nozzle to spray the soap into the pool or the clean sponge. The downward hole and longer spout results in less mess from misses. The spout is long enough to reach into the sink area. ✔ Elegant design keep press dispenser offers an easy-dispensing mechanism combined. As a good helper, it is suitable for kitchen or bathroom cleaning. - Welcome to contact us from amazon email if you have any concerns! - We promise to offer you with a good service for your shopping experience! Now click the 'Add to Cart' button, get the amazing Well Built and Sturdy Countertop Soap Dispenser! ♛ EASY TO INSTALL AND USE: Extremely easy to install in just a few short minutes. Simple to install without any tool. The head of this Kitchen Liquid Sink Soap Dispenser freely rotates by 360° so the spout can be moved out of the way when not in use. ♛ LARGE BOTTLE: Large capacity 17 OZ HD-PE bottle and 2.8" nozzle, acid and corrosion resistance. Less filling up. ♛ PUMP ACTION RELIABLE: Easy to control how much soap comes out, soap liquid jet smooth, no leak and doesn't jam when pressing for soap. The built in hand kitchen lotion soap dispenser pump is always primed and dispenses good volume so it doesn't have keep pumping multiple times to prime the unit and get enough soap dispensed. ♛ EASY TO REFILL: It can be filled from the top simply by lifting the pump off the base. So don't have to be getting under the sink for awhile to refill. So simple. ♛ HIGH QUALITY AND 5-YEAR WARRANTY: Made of heavy-duty 304 stainless steel - polished, strong, acid-resistance, corrosion-resistance durable and polished process, looks shiny and works great. The kitchen dish sink soap dispenser built in hand soap dispenser pump, steel ball, thread, spring are all 304 stainless steel, rubber gasket, the seal was tight. If you have any questions about this product by REY-X, contact us by completing and submitting the form below. If you are looking for a specif part number, please include it with your message.